I love a bit of statement jewellery and where a few short months ago I was all about the finger candy, I’ve now moved on. 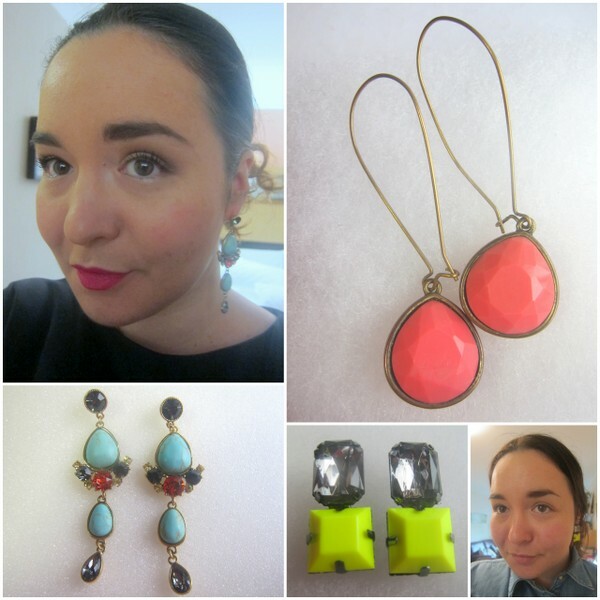 These days, from chandeliers to crystals, I’m all about the ear-rings, and the shinier the better. Like red lipstick or the perfect flicky eyeliner, I think they take me up a dress code. Here are a few of my favourite pairs. ONE My friend Lola has the most exquisite taste and her presents are always cause for much excitement. I think she’s outdone herself with these dazzling danglies, featuring turquoise drops and multi-coloured crystals. They're from Martine Wester, and they make me feel so fancy! TWO These cheery neon-yellow and crystal ear-rings look fabulous with my favourite plain grey tee and never fail to put a smile on my face. I like the classic stud design paired with the modern, on-trend colour and they were cheap as chips (€7.88 from ASOS) too, which helps. THREE Ok, so this coral pair may be a little understated but they have seen me through many a sun holiday with ease. My typical holiday style is to pile my hair up in a messy topknot and add a pair of shoulder skimmers – I think they distract from my shiny face, and make me look a little bit done. These ones are feather light and are past season Miss Selfridge – they cost me about a fiver, I think, which was definitely money well spent. Do you like your jewellery to make a bit of a statement? And where do you buy yours? Nice, I love statement jewellery :-) I never leave the house without ear rings! The turquoise pair are gorgeous! I have to be careful what I put in my ears due to irritation, but as you know I love my jewellery!!!! I'm ALL about the statement bling. Cheers me up no end. I love the blue pair. Have a great weekend Emma. you've just reminded me to go bust out my very neglected earrings! I love the coral pieces-- definitely a great buy! Used to be into statement earrings, but lately cant brake away from my little beaded studs. Lovely choices as always. Those turquoise ones are gorgeous Emma! I actually just bought a turquoise ring, I just think it's such a pretty colour for jewellery. I think earrings like that can be so great with a very simple outfit. I love wearing statement earrings with a classic black dress, the bigger the better! Great earrings! Love the three pairs. All adorable, my fave are the coral ones! I really like the coral ones! I'm desperate at accessorizing, but I want so much to get into it! This makes me want to even more!